Editor/Author Le Sueur, James D.
Algeria's democratic experiment is seminal in post-Cold War history. The first Muslim nation to attempt the transition from an authoritarian system to democratic pluralism, this North African country became a test case for reform in Africa, the Arab world and beyond. Yet when the country looked certain to become the world's first elected Islamic republic, there was a military coup and the democratic process was brought sharply to a halt. Islamists declared jihad on the state and hundreds of thousands of civilians were killed in the ensuing decade of state repression. 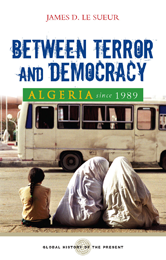 Le Sueur shows that Algeria is at the very heart of contemporary debates about Islam and secular democracy, arguing that the stability of Algeria is crucial for the security of the wider Middle East. Algeria Since 1989 is a lively and essential examination of how the fate of one country is entwined with much greater global issues.